Access the record the file needs to be attached to. For example: personnel, aircraft, trip record. Go to the Files section and click or drag and drop to upload new file. 3. Once uploaded, click the pencil icon next to the file name. Click on the "Information" tab to edit the file name by clicking on the blue underlined fields. 4. To add tags to the file, click on the top search bar where it says "Search Tags" and select the related tag. 5. Click on the "Shared" tab to share the file. To share with a Group or select Personnel, click in the field and type in the name of the group or personnel. To share with All Personnel, click on the box and select "All Personnel" from the drop down. 6. 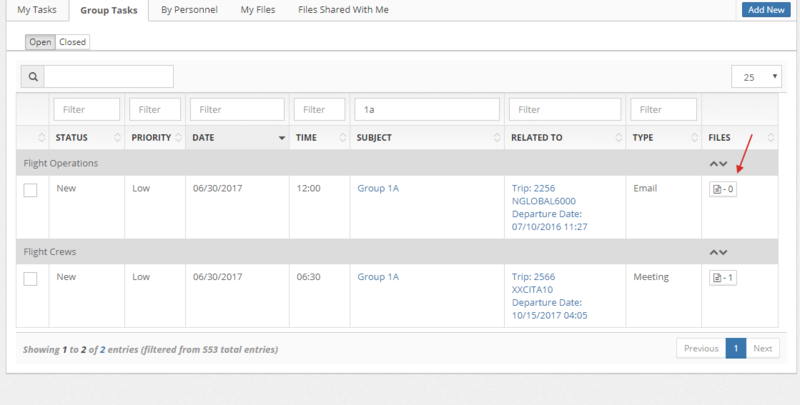 To add the file to other records, such as a specific trip or aircraft profile, etc. select "Related" tab. Then choose the type of record from the drop down and enter the specific record details, i.e. tail #, trip #. Go to Dashboard > My Files. In My Files the user will have access to all files they have uploaded in the system. Use the search field to search for any file by name, related to date, etc. To the right of the file are icons to download or edit the file. Note: To delete, click on the edit icon and then click on "Delete File"
Go to Dashboard > Files Shared With Me. In Files Shared With Me, the user is able to see and access all files that have been shared with them. To the right of the file are icons to download. Only the user that shared the file has the ability to edit and delete the uploaded file. Go to Dashboard > My Tasks. In the My Tasks, the user is able to add a file to a task that is assigned to them. At the right side, the column labeled Files has an icon. The user can click on the icon, select a file and click upload. Only the user that shared the file has the ability to edit and delete the uploaded file. The file icon will then show the number of files attached to the task.